We intentionally planned our big day for April, typically a quiet month for work before wedding season begins in New England. 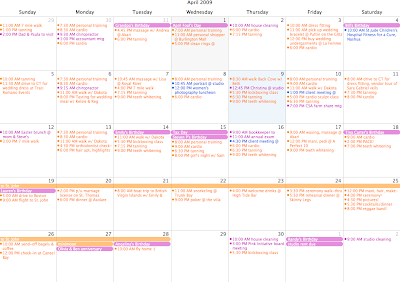 In addition to regular 10-5ish hours at the studio all week, the orange appointments on the calendar above are wedding related tasks, blue are photo assignments or meetings, and pink are routine doctor visits and such. Despite how insane that orange calendar looks, it has been the ideal time to focus my energy on wedding preparations and pull back from work a bit (In a month or two, that calendar will be saturated with blue). This has been an experiment of sorts as I don't usually spend this much effort/time/money on myself; I am always pouring my heart and soul into my business (not to mention J, the dogs, family, etc). It's a funny, delicate dance we do, trying to wear so many hats in so many different areas of life and maintain such perfect balance. Balance. We all want it, but does anyone actually practice it perfectly? I am lucky that I've had the opportunity to build that "me-time" into my schedule seeing as I am my own boss and the keeper of my schedule. I'm also lucky that J has been involved in this process and done a good chunk of the legwork. Wedding planning is darn hard work! The best bit of advice I can give at this point to soon-to-be-brides (not yet having followed this through to see if I'm actually right) is to enjoy this process as much as you are able. When we first got engaged, I sat down with a mound of bridal magazines and my eyes lit up with all the possibilities. I quickly put those in the recycling bin because I never wanted to be the bride who is all engrossed in the plans, 24/7, exploring and exhausting every possible wedding trend. Working in the wedding industry gave me incredible insight, and also a bit of a handicap. We decided on a destination wedding to experience a warm weather climate and do something different than what we photograph in New England every weekend in the summer. That's it, plain and simple. And we kept circling back to that goal each time Ms. Stewart's intricate influence dared tempt me. I've really loved working with J on our vision to create an event that reflects us as a couple and our personalities. My favorite part, I think, was the night we stayed up late and wrote our ceremony. We laughed, got goosebumps and opened our eyes a bit wider with a greater excitement for April 25th and all that it means. The last few weeks have been a whirlwind with a derailed cardio schedule because of a minor knee injury (Overuse. Go figure. All better now, phew! ), invitations printed in a not-so-perfect hue and, oh yeah, that minor panic of finding another wedding dress! And while I've lost sleep and shed tears, I've also accomplished a lot and sought the best solutions possible, never once forgetting the Big Picture significance of these little hurdles. My Nana likes to say the phrase 'This too shall pass' (ironically the way Traci closed her email to me at the beginning of my Palm Sunday adventure last week). And it does. Things happen; keep moving forward. If you're not a planner, or even if you are, keeping a Steno pad handy to jot things down and keep a running To Do list has been super helpful. We also created a detailed Excel spreadsheet of all of our contacts, payments paid and due dates for balances still owed. I hate charting money because it makes my stomach turn to watch my savings spent, but it has been helpful to get the numbers down on paper instead of floating around in my head. We could have pulled off our wedding for less money, but our vision was really important to us. We sacrificed a less expensive dinner at a restaurant, for instance, for the feel we're after of an intimate dinner party catered by friends at our private villa and the associated extra costs for doing so. My advice? Definitely outline a budget, but realize that what you think your wedding will cost is usually considerably less than what you end up spending. Achieving harmony with a wedding budget is very touchy, and the one area I hear causes couples the most strife. To maintain good zen between us, J and I look forward to nightly shared dinners and the opportunity to slow down, catch our breath and check in with each other. We've also taken this one step further, and invested in some couples counseling a few times a month. I have been a talking couch client since my parents divorced when I was 8, learning at a very young age to talk through conflict/feelings/issues toward resolution. J and I decided this would be a healthy practice for us to do together, working toward a stronger foundation as we start this next chapter as Mr. and Mrs. I can't say enough good things about the experience and am so surprised how much deeper we've peeked into what makes us work as a couple and individuals in those 60 minute sessions. It's hard work, but I would encourage all couples to commit the time to focus that finely on your relationship's core. When all is said and done, it is just one day. But gosh, what a glorious one day it will be!! J and I have grown so much closer over the last 10 months planning, in a way only understood by married couples who can appreciate and remember the teamwork involved. We really rallied together! Had we eloped (our Plan A) it would have been simpler, yes. But I am not sure we would have had such a rewarding biproduct of the planning: a stronger us. Sharing every detail of my personal process with you has been a fun reflection, and I'm so grateful for your kind feedback and advice as we are literally just days away from the main event. Your love and friendship means the world to us, and we cannot wait to share all the fantastic details of how everything unfolds- soon! Hi Emilie - it was so much fun to read your blog!!! What a fun wedding week it looks like you two have planned. I love all the details – especially the dinner at Asolare and the trip to the BVI’s. You are so organized and it looks like you did a really great job at planning every detail. I love that the rehearsal dinner is at Skinny Legs (what a great pick to highlight the essence of St. John!) and the welcome drinks are at High Tide Bar (great location!!!). I can picture both of these places so vividly and it seems like you have such a perfect, personalized plan leading up to the big event. It is so much fun to see how another St. John bride/couple interpret their vision, and how their big day comes to life. I do hope you post pictures! I would love to see your beautiful, contemporary villa decorated for the main event, and the lovely reception that I know it will host. Best of luck to you and your fiancé as you embark on this most wonderful, memorable experience! Soak up every single solitary second! I know it will be amazing! Congrats!